In October 2006, the U.S. Census population clock reached the 300-million-person mark. After some notoriety in the media, the clock proceeded to do what it does best: move forward. Our nation has a long history of population growth and an equally long history of building new places to meet the demands of this growth. While American frontiersmen may have settled the land quickly during the expansion years, they did not necessarily plan their towns in haste. A survey of towns from across the country reveals that many beloved and important places were created using a few dozen distinctive formal town patterns. These patterns were repeated again and again to provide a familiar setting for waves of migrating Americans who were looking for a place to call home. Repeating town patterns helped surveyors and state general assemblies quickly establish county seats and bring law and order to new territories. At the same time, many land speculators used the same regional patterns to market their new towns as important cities of tomorrow. These patterns were efficient tools for planning and development. They were easy to plat and sell, adaptable to topographical challenges, and flexible enough to provide for future town expansion or accommodate changes in new building types or uses. These same patterns are still available for use. Today, when new towns are planned, it is common for those involved to collect examples of local architectural styles, buildings, foliage, and streets. These items serve to guide and inspire the place-making process. An inventory of formal town patterns can serve the same purpose. This paper demonstrates how a collection of town patterns may be incorporated into the planning and design process. Lately, more communities are giving serious thought to how and where they are going to grow, and what the character of this new development will be. Often, communities will plan for development through a charrette, a series of intense workshops in which developers, community leaders, and local residents discuss their concerns, ideas, and goals for development. During the charrette, professional planners and community members will collect examples of things they like best in their town or other places they admire. These may be beautiful buildings, pleasant streets, fascinating architectural styles, and technical features that may not be noticeable to the untrained eye, but provide the special details needed to turn any place into a great place. Formal town patterns are another important design element available for the planning and design of new towns. The way streets and blocks are laid out can create familiarity and ease of navigation that makes residents and visitors feel comfortable and safe. How civic, commercial, and other uses are distributed, and where buildings are specifically placed on their respective lots, can improve the way a town functions. In this regard, formal town patterns have quite literally served as the foundation for many traditional American places. With respect to new development, using time-tested patterns located throughout an area allows a developer to offer a familiar product that has a track record in the market. Reusing an existing pattern can speed up the development process while saving time and money. There are certain primary characteristics that identify and define formal town patterns. The two key components are the street and block layout, and the relationship between this layout, the location of specific uses, and placement of buildings on their respective blocks and lots. A street system can indicate a pattern either by placing streets at uniform distances from one another or by placing them at alternating and repeating distances. Street widths can also reinforce evidence of a pattern. As a general rule, traditional street widths are arranged from widest to narrowest based on commercial importance and residential charm. The size, shape, and arrangement of blocks can also indicate a pattern. A pattern can be recognized by a uniform and repetitious arrangement, where the size and shape of the blocks are constant. Such blocks may be square or rectangular. Alternatively, a pattern may arise from a sequence of square and rectangular blocks of varying sizes within a plan. A good example of how a network of streets and blocks define a town’s pattern can be found in Savannah, Georgia. 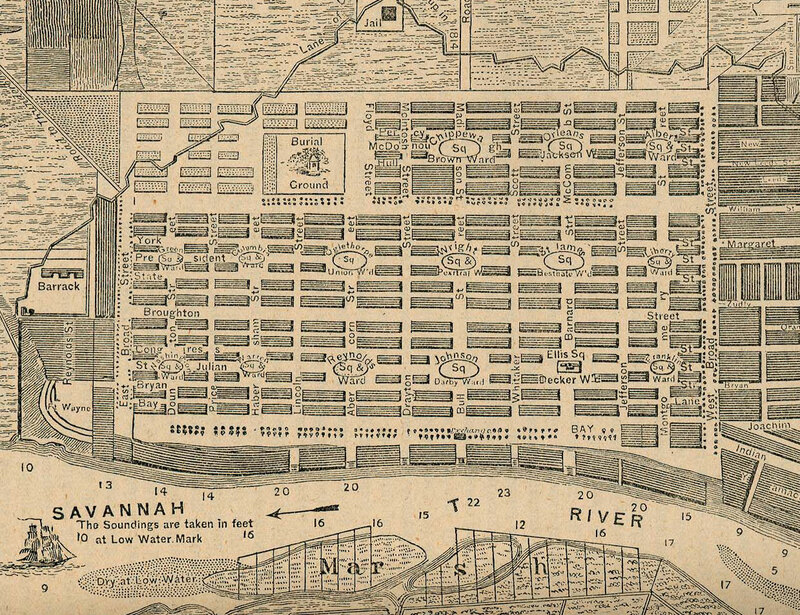 Savannah was planned and expanded upon by repeating the design of a single neighborhood unit 24 times. The neighborhood pattern comprised nine blocks, which were one of three sizes, along with a system of narrow streets. As each additional neighborhood unit was repeated on the city grid, streets of two different widths connected them together. The wider street widths were used to accommodate the traffic and commercial uses outside the neighborhood, while the narrower streets inside the neighborhood were designed to serve homes and small parks. Formal town patterns do have a range of shared common dimensions of street widths and block sizes; however the specific details within each pattern are beyond the scope of this paper. If a formal pattern is to be considered as a model for a new town, a study of local dimensions taken from existing towns in the area with such a pattern is recommended. A network of streets and blocks may indicate that a town has a deliberate plan but this is only partial evidence that a formal town pattern exists. A formal pattern requires an intentional relationship between the town’s layout and the location of specific uses and building placement on the blocks and individual lots. This relationship gives purpose to the town’s plan and intelligence to the organization of the uses. Building placement on individual parcels reinforces a sense of order to this relationship. The hierarchy between the buildings and the open spaces creates the all-important public realm. These two factors working together transform a layout with little or no meaning into a place with a functional town pattern. The combination of these two factors creates a formal town pattern. The formal Courthouse Square pattern is a good example to show how patterns are identified based on this relationship. A street map of a town laid out on a grid of square and rectangular blocks does not, by itself, ensure that a formal pattern exists. The map does not indicate any special purpose between the layout and the order, function, or arrangement of landmarks, buildings, public spaces or districts. Nor can these elements be assumed to exist. Therefore, a map does not indicate whether the layout represents a formal town pattern. However, an aerial picture of the same town represented in the map can reveal that the central block is a public square with a building in the center. If this square is surrounded by other blocks whose buildings front the square, the relationship between layout, usage, and placement indicates a formal pattern, most likely that of the traditional Courthouse Square. Just like beautiful buildings and attractive architectural styles, a traditional town pattern can be a desirable feature of a new town’s master plan. Local patterns in a region may be identified and considered for use wherever new towns are proposed. As a case study, this paper focuses on the formal town patterns found in and around the surrounding counties of York, Pennsylvania. Today, the diamond pattern has many variant patterns that can be found throughout the country, due in large part to emigration from Pennsylvania. Just as settlers transported their traditions, customs, and religion, they also brought familiar ideas about what a town looks like. This case study identifies four distinct diamonds found in York County, Pennsylvania, and the surrounding counties of Adams, Cumberland, Dauphin, Lancaster, and Lebanon. For local reference only, the diamonds identified in this paper have been named after a town where they can be found. The Lancaster Diamond is identified by a central square at the intersection of its two major roads. This pattern is created when the corner parcels from each of the four blocks are recessed where the two primary streets intersect. This creates an open space in the center. The surrounding commercial and civic buildings front the recessed space along the setback. There is also a formal space in the center, be it a courthouse, a green, a fountain, a statue, or the like. Due to significant changes to Lancaster’s square over the years, an example of the Lancaster Diamond is better represented by an illustration of Gettysburg, in Adams County. Neither Lancaster nor Gettysburg has a courthouse in its square anymore, but both still retain a formal center within the intersection. Other Lancaster Diamonds in the area can be found in Goldsboro in York County and Maytown in Lancaster County. Just as a formal center and surrounding buildings are helpful to identify a town pattern, so is the network of streets and blocks surrounding the center. All of the towns mentioned above are organized as a grid of square blocks. The square blocks at Gettysburg become rectangular east of the town center. By contrast, the York Diamond has no formal center within the intersecting streets. In this case, the four recessed corners are treated as four separate smaller plazas or squares. Commercial and civic buildings front the recessed open spaces. This pattern is found in towns such as Schaefferstown in Lebanon County, Middletown in Dauphin County, and Dillsburg in York County. These four towns are composed of a grid of square blocks. Elizabethtown, in Lancaster County, and Carlisle, in Cumberland County, employ the York Diamond but have a grid of rectangular blocks. There are two types of diamonds found in Lebanon. It is rare to find two formal patterns in one town. For specificity, each is identified by the name of the street on which it located. The Federal Street Diamond is an elongated variant of the Lancaster Diamond in that it has a formal center. The difference here is that the Federal Street Diamond is created by exaggerating the length of the setback beyond the corner parcels. Historically, towns that used this pattern had a courthouse in the center and two greens used for markets flanking the courthouse. Reading, in Berks County once had such a configuration but it no longer exists. In the York region, the Federal Street Diamond is also found in Millersburg in Dauphin County, Marietta in Lancaster County, and Manheim in Lebanon County. The street-and-block network varies among these four towns between grids of rectangular blocks, and grids of square and rectangular blocks. The Ninth Street Diamond can also be found in Lebanon. This diamond is intersected by Cumberland Street, the main commercial thoroughfare. Similar to the Federal Street Diamond, the length of the center is created by an elongated setback that extends beyond the corner parcels at the main intersection. The principal distinction is the absence of a formal center within the street intersection. In this regard, this pattern is similar to the York Diamond. Fredericksburg and Jonestown, also in Lebanon County, feature this pattern. In all three examples, the towns are composed of a grid of square blocks. The region around York County shows how one root pattern, the diamond, is versatile and flexible enough to be repeated and altered into new patterns over time. These patterns are simple, elegant, and timeless. They can be found in big cities and small villages. New development projects in this region may do well to replicate one of these patterns, as they are familiar to Pennsylvanians. Yesterday’s formal patterns are still available for today’s use. Developers may find such patterns economical, efficient, and favorable when considering the design process, the development process, and the marketing and selling of a new project. At the site level, these patterns provide a sense of order and structure that helps create memorable places that are admired and cherished. At the larger level, town patterns can reinforce a region’s character, culture, and identity. Great care should be given to the design of a new town, with consideration of formal town patterns that are the foundations of many traditional towns. Buildings, uses, and styles can change over time but streets and blocks have greater permanence. Examining the formal patterns of local towns is a critical piece of the place-making process that should not be overlooked. Lee S. Sobel is the author of Greyfields into Goldfields: Dead Malls become Living Neighborhoods.